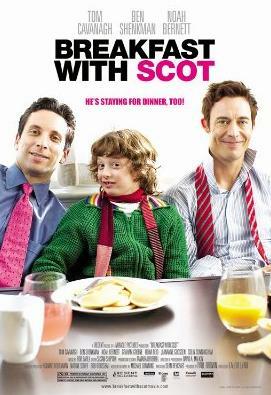 In Breakfast with Scot, directed by Laurie Lynd, Ben Shenkman plays Sam, a sports lawyer who, together with his boyfriend, Eric (Tom Cavanagh), takes care of Scot (Noah Bernett), the 11-year-old son of his brother's dead ex-girlfriend. Scot struggles to make friends and be accepted while unashamed of his girliness. Eric, a former hockey player, prefers that he would supress his girly, flamboyant behavior and signs him up to play hockey. Ben Shenkman has previously had smaller roles in Then She Found Me, Just Like Heaven, Must Love Dogs, Pi, Eraser and Quiz Show. He also performed in the Broadway show "Proof" and in the TV series "Law and Order". It was a real privilege to interview him. Regent Releasing opens Breakfast with Scot on October 10th, 2008 at the Quad Cinema. NYC MOVIE GURU: What’s the significance of the word “breakfast” in the title Breakfast with Scot? BEN SHENKMAN: I’m not sure about that, but it’s possible that it’s a reference to Breakfast at Tiffany’s, which is in some ways a sort of cultural, gay touchstone. That’s the way that I read it. [Also], breakfast is kind of a family thing. For lunch and dinner, you go out into the world and encounter other people, but who you have breakfast with is who you wake up with, which means that’s who your family is. That’s a shorthand of saying that a new family is being made in Breakfast with Scot. NYC MOVIE GURU: What appealed to you about screenplay of Breakfast with Scot? BEN SHENKMAN: I liked how gentle and genuinely sweet the [screenplay] was because you can easily approach this territory with easy snarkiness and I thought it’s a little bit trickier to do it in a more open-hearted way. I trusted that the jokes are there and that the movie won’t be snorted at by a sophisticated audience. It’s nice to see a movie that’s not treacle and over-sentimental, but that it does comes from a real sense of vulnerability of being that age. It allowed you to understand the adults who themselves feel vulnerable just by being around who’s that age and going through that. NYC MOVIE GURU: How did you know to trust director Laurie Lynd? What impressed you the most about him? BEN SHENKMAN: You don’t know and yet you simply do trust. You have to trust no matter who you’re working with because often people who are very experienced will go down the wrong path. So, each time you step out into something with people, you just trust that everyone is doing their best job. In this case, it felt easier to trust him because he understood the material so well and his inherent personality wasn’t [egotistical]. He was great at listening to other people and also able to be perfectly firm about his choices, so that inspires confidence. For a director of a three-week shoot, to get a feature in the can, I found him exceptionally relaxed. NYC MOVIE GURU: Did you read the book before signing on to be in the film? BEN SHENKMAN: No, I never read the book. I know just from knowing the filmmakers where it departs from the book. I know that the book was successful and our producers and directors loved the book, which is why they made it [into a movie]. NYC MOVIE GURU: How do you work with kid actors such as Noah Bernett? BEN SHENKMAN: The trick is that you have to work with them just like you work with a grown-up actor which is to find a way to enjoy each other’s company because there’s a lot of time when you’re not working and waiting for other people. Often, when people work with kids, what they wind up doing is over-rehearsing them, so they wind up drilling the performance into the kid. What kids are better at doing than adults is allowing the performance spontaneously in front of the camera. Both Tom and I kept an eye on that and kept reminding him that it’s perfectly okay to throw away whatever the rehearsed little thing was. Sure enough, once he sensed that, he would get better and better. NYC MOVIE GURU: How did you bond with Noah Bernett offset to make him feel more comfortable? BEN SHENKMAN: We did have rehearsals, but it’s not like you have to design a rehearsal in order to bond and make him comfortable. It’s simply that in the course of spending time together, you become comfortable which is the same with any other actor. One of the things that happens in movies is that you often don’t have a lot of rehearsal and you often don’t have a lot of time to create a relationship with somebody that you need to have a deep relationship with onscreen. On the other hand, in Breakfast with Scot, it’s a new relationship and it’s not until the end of the movie that those characters become fully comfortable anyway. It’s not like when you meet a child actor that’s supposed to be your child for all your life, so there’s not that much distance to cover. NYC MOVIE GURU: What kind of experience have you had when it comes to taking care of a child? BEN SHENKMAN: It was very little when we made the movie and now I’m a new parent of a 6-weeks-old [baby]. That’s very different than inheriting a fully formed 11-year-old. I intuited some things about parenthood such as that it’s easy to worry about your kid inheriting some part of you that you are not resolved and comfortable with. The funny thing about being a parent is that someone who feels invisible is made as vulnerable as the child they care about. That’s where the joke is and where the pathos is. NYC MOVIE GURU: How has your experience as actor in theater prepared you for acting in films? BEN SHENKMAN: It’s in theater that you learn how a story functions in real time. You’re telling a story from beginning to end in two hours and you are present with the audience as you get that story and you’re responsible for delivering it in the way that it will work for them. You’re [also] responsible for being aware of that while you’re doing it. If you learn to act in film, you’re able to be unaware of how the whole thing orchestrates and works together for the audience. [Instead], you just contribute your little piece and it gets taken away and put together by somebody else who has to be aware of that. NYC MOVIE GURU: How did the characters Sam and Eric originally meet? BEN SHENKMAN: The fact that Eric’s a hockey player is just for the movie; it doesn’t come from the book. There’s a scene when Eric is talking to Scot and he says something like, “Well, I got hurt and Sam took care of me.” The idea was that Sam was the sports lawyer, the team’s lawyer, and, so when Eric got hurt, whatever legal issues were involved in creating a retirement or pension for Eric was part of Sam’s job. That’s how they met and how the relationship came about. NYC MOVIE GURU: What question do you have in your mind to ask about Scot as he grows older? BEN SHENKMAN: One of the [questions] that comes up is, “Is Scot really gay?” and what does it mean to talk about being gay when you’re pre-sexual. I intuit that kids are gay from an early age and that there’s no such thing as pre-sexual. Even young kids are sexual even though they don’t act on their sexual impulses. I believe that if you’re gay, you’re 4 or 5-years-old and having crushes on male figures in the same way that a straight person has a crush on females from an early age. NYC MOVIE GURU: How do people change the way they’re judgmental about others as they grow older? BEN SHENKMAN: They learn the social graces of keeping their opinions about people private. As you see, when the stakes get high and people get agitated, the same attitudes tend to come up. Look at electoral politics, for example. Look at the way the media covers politics, [which] isn’t that far away from a schoolyard. I don’t know if people change that much. To some extent, the movie’s about people who have worked very hard to make themselves feel normal after not to feeling normal as kids, so that the idea of being presented with a kid who has not inclination or ability to try to be normal is what makes them all agitated. In a way, the kid is a couple of steps ahead of them. NYC MOVIE GURU: Have you experienced any kind of alienation as a child? BEN SHENKMAN: Not in a dramatic way as in the movie. Being a girly boy is a very marking thing. If that’s your story, that’s a very ostentatious and particular way of feeling “other”. In smaller ways, almost everybody feels moments of “otherness” or alienation in different ways. [They] consciously or subconsciously have to choose certain things in order to stay safely out of that territory. [However], sissy kids can’t cover it up and blend in, so they have to face all that stuff.